Just before entering Malibu along the coastal highway of California. Although Aristotle in general had a more empirical and experimental attitude than Plato, modern science did not come into its own until Plato's Pythagorean confidence in the mathematical nature of the world returned with Kepler, Galileo, and Newton. For instance, Aristotle, relying on a theory of opposites that is now only of historical interest, rejected Plato's attempt to match the Platonic Solids with the elements -- while Plato's expectations are realized in mineralogy and crystallography, where the Platonic Solids occur naturally.Plato and Aristotle, Up and Down-Kelley L. Ross, Ph.D. Discover Magazine-06.16.2008-Photography by Erika Larsen-Article-"Is the Universe Actually Made of Math? 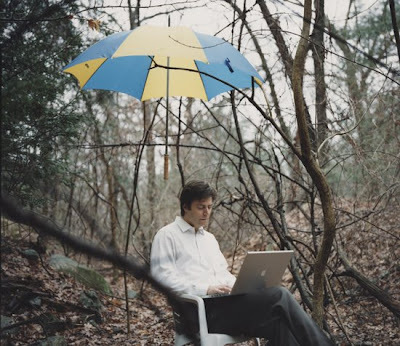 Unconventional cosmologist Max Tegmark says mathematical formulas create reality." It makes no difference at this point, which mathematics you choose to delve into the new model perceptions, because if one were to see how a projective geometry was built on previous platforms, then how is it we can see the universe in ways that the WMAP shows unless the mathematics could show that there was more to it then an artists picture displayed? You had to know the depth of the artists skill. It does not mean that you are devoid of the possibilities of venturing where the philosophies of mathematics or science can venture. It is understanding that by taking yourself to a certain position in mind, an indecomposable one, one that is self evident, then it is understood that the deductive/inductive efforts bring you to a peak realization, contained in the "Aristotelean Arche." Yes you may of noticed the date is wrong again on the camera. Every time we take the batteries out for charging, we loose that date. It dawned on me at this moment and wondered if there is another internal battery that retains the time, maybe, dead too? I'll have to look. Anyway this fellow has been sticking around the last couple of days. When we first looked at this lot about a year an done month ago today, I noticed a lot of markings that looked like claw marks, were in fact bull moose who rub their racks on the trees and leave these marks. 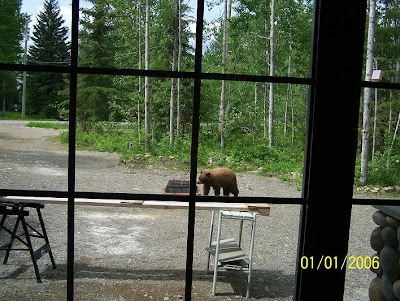 You'll also notice my work table I set up to do the final work on the outside of the house. I was installing a product called Nailite We did a board and batten around the rest of the house. I am really quite pleased tackling this job for the first time. I just finished about two days ago, and have been working like heck to finish the jobs around here, while preparing for a trip into the states. My wife, myself with three of our older grandchildren are going for a trip to Disney Land. We had our youngest granddaughter yesterday(she's sure a sweety) for the night, as my youngest son and his wife are due for twins which will be here not to long after we get back from our trip. She needs the bed rest and she is huge, and my boy is getting run ragged. So we have been extremely busy getting things in order. 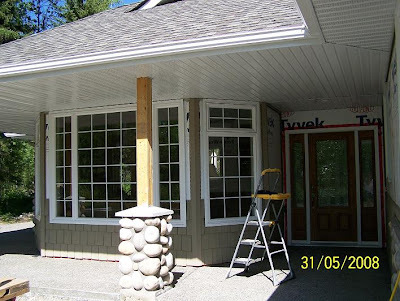 The pillars in front of the house will be done when I get back and the backdrop to the front door will have a colonial look which we are trying to keep to a cottage look. 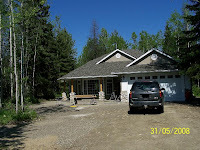 The aggregate walkways around the house were done at the end of May. We are please with how this has turned out. Unfortunately, the snow came before we had a chance to pour them last November, after having readied the forms, and compacted the crush. "No Royal Road to Geometry?" Are you an observant person? Look at the above picture. Why ask such a question as to, "No Royal Road to Geometry?" This presupposes that a logic is formulated that leads not only one by the "phenomenological values" but by the very principal of logic itself. I don't think I could of made it any easier for one, but to reveal the answer in the quote. Now you must remember how the logic is introduced here, and what came before Euclid. The postulates are self evident in his analysis but, little did he know that there would be a "Royal Road indeed" to geometry that was much more complex and beautiful then the dry implication logic would reveal of itself. It's done for a reason and all the geometries had to be leading in this progressive view to demonstrate that a "projective geometry" is the final destination, although, still evolving? Eventually it was discovered that the parallel postulate is logically independent of the other postulates, and you get a perfectly consistent system even if you assume that parallel postulate is false. This means that it is possible to assign meanings to the terms "point" and "line" in such a way that they satisfy the first four postulates but not the parallel postulate. These are called non-Euclidean geometries. Projective geometry is not really a typical non-Euclidean geometry, but it can still be treated as such. The projective axiom: Any two lines intersect (in exactly one point). If you are "ever the artist" it is good to know in which direction you will use the sun, in order to demonstrate the shadowing that will go on into your picture. While you might of thought there was everything to know about Plato's cave and it's implication I am telling you indeed that the logic is a formative apparatus concealed in the geometries that are used to explain such questions about, "the shape of space." There are two reasons that having mapped E8 is so important. The practical one is that E8 has major applications: mathematical analysis of the most recent versions of string theory and supergravity theories all keep revealing structure based on E8. E8 seems to be part of the structure of our universe. The other reason is just that the complete mapping of E8 is the largest mathematical structure ever mapped out in full detail by human beings. It takes 60 gigabytes to store the map of E8. If you were to write it out on paper in 6-point print (that's really small print), you'd need a piece of paper bigger than the island of Manhattan. This thing is huge. 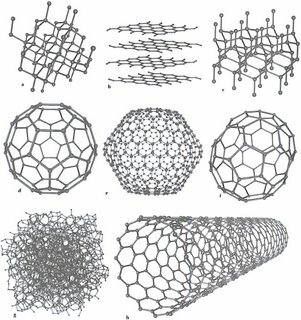 Polytopes and allotrope are examples to me of "shapes in their formative compulsions" that while very very small in their continuing expression, "below planck length" in our analysis of the world, has an "formative structure" in the case of the allotrope in the material world. 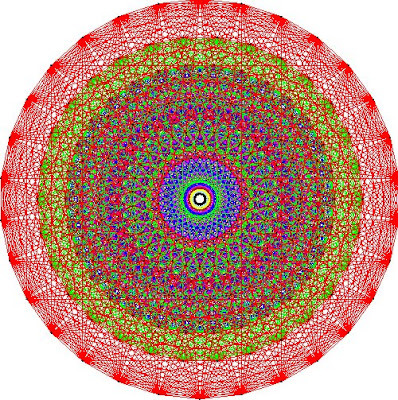 The polytopes, as an abstract structure of math thinking about the world. As if in nature's other ways. Graphite exhibits elastic behaviour and even improves its mechanical strength up to the temperature of about 2500 K. Measured changes in ultrasonic velocity in graphite after high temperature creep shows marked plasticity at temperatures above 2200 K . From the standpoint of thermodynamics, melting is a phase transition of the first kind, with an abrupt enthalpy change constituting the heat of melting. Therefore, any experimental proof of melting is associated with direct recording of the temperature dependence of enthalpy in the neighbourhood of a melting point. Pulsed heating of carbon materials was studied experimentally by transient electrical resistance and arc discharge techniques, in millisecond and microsecond time regime (see, e.g., [17, 18]), and by pulsed laser heating, in microsecond, nanosecond and picosecond time regime (see, e.g., [11, 19, 20]). Both kind of experiments recorded significant changes in the material properties (density, electrical and thermal conductivity, reflectivity, etc. ) within the range 4000-5000 K, interpreted as a phase change to a liquid state. The results of graphite irradiation by lasers suggest  that there is at least a small range of temperatures for which liquid carbon can exist at pressure as low as 0.01 GPa. The phase boundaries between graphite and liquid were investigated experimentally and defined fairly well. 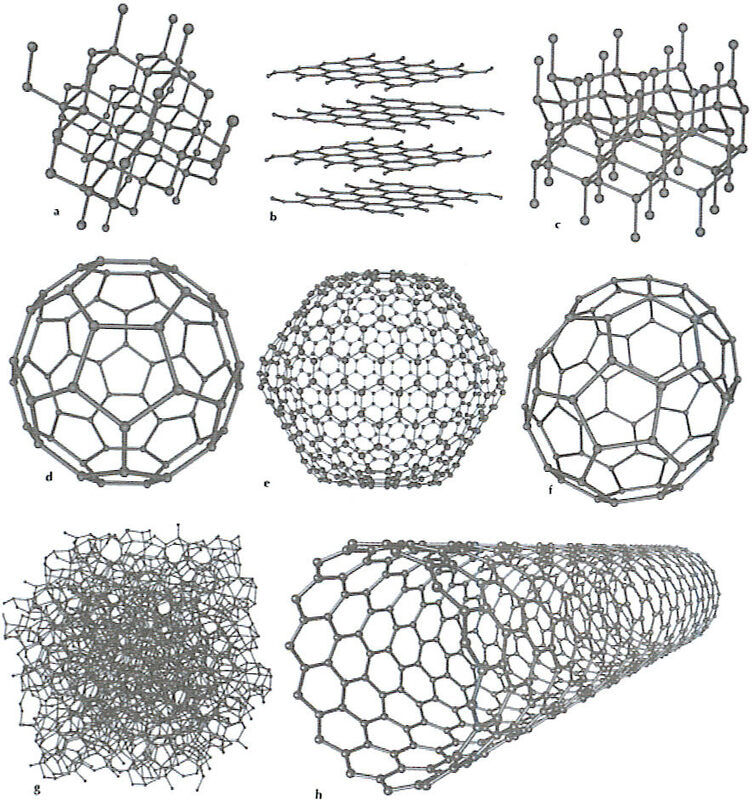 Moving to polytopes or allotrope seem to have values in science? Buckminister Fuller and Richard Smalley in terms of allotrope. As the furthest extent of the Conjecture , how shall we place the dynamics of Sylvestor surfaces and B Fields in relation to the timeline of these geometries? Historically this would seem in order, but under the advancement of thinking in theoretics does it serve a purpose? Going beyond “planck length” what is a person to do? Thanks for the clarifications on Lagrange points. This is how I see the WMAP. Diagram of the Lagrange Point gravitational forces associated with the Sun-Earth system. WMAP orbits around L2, which is about 1.5 million km from the Earth. Lagrange Points are positions in space where the gravitational forces of a two body system like the Sun and the Earth produce enhanced regions of attraction and repulsion. The forces at L2 tend to keep WMAP aligned on the Sun-Earth axis, but requires course correction to keep the spacecraft from moving toward or away from the Earth. Such concentration in the view of Sean’s group of the total WMAP while finding such a concentration would be revealing would it not of this geometrical instance in relation to gravitational gathering or views of the bulk tendency? Another example to show this fascinating elevation to non-euclidean, gravitational lensing, could be seen in this same light. A superfluid gas can flow without resistance. It can be clearly distinguished from a normal gas when it is rotated. A normal gas rotates like an ordinary object, but a superfluid can only rotate when it forms vortices similar to mini-tornadoes. This gives a rotating superfluid the appearance of Swiss cheese, where the holes are the cores of the mini-tornadoes. "When we saw the first picture of the vortices appear on the computer screen, it was simply breathtaking," said graduate student Martin Zwierlein in recalling the evening of April 13, when the team first saw the superfluid gas. For almost a year, the team had been working on making magnetic fields and laser beams very round so the gas could be set in rotation. "It was like sanding the bumps off of a wheel to make it perfectly round," Zwierlein explained. 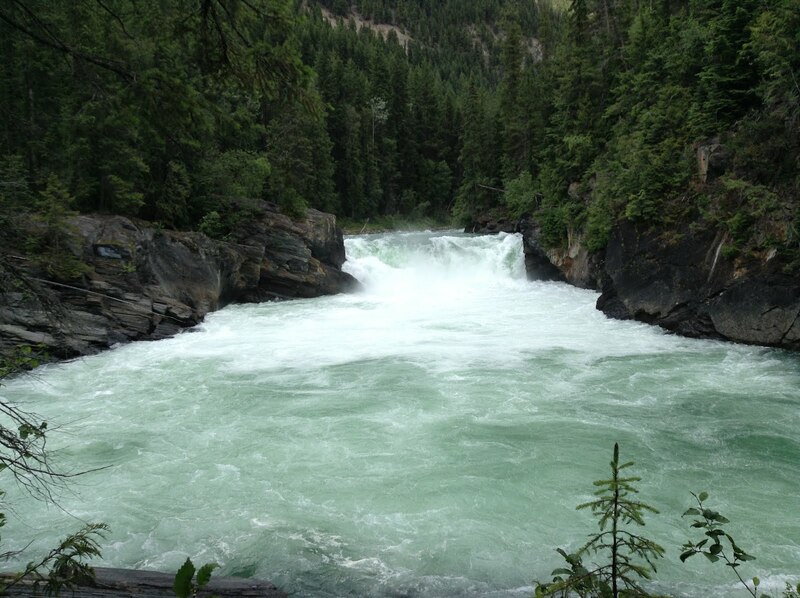 "In superfluids, as well as in superconductors, particles move in lockstep. They form one big quantum-mechanical wave," explained Ketterle. Such a movement allows superconductors to carry electrical currents without resistance. The MIT team was able to view these superfluid vortices at extremely cold temperatures, when the fermionic gas was cooled to about 50 billionths of one kelvin, very close to absolute zero (-273 degrees C or -459 degrees F). "It may sound strange to call superfluidity at 50 nanokelvin high-temperature superfluidity, but what matters is the temperature normalized by the density of the particles," Ketterle said. "We have now achieved by far the highest temperature ever." Scaled up to the density of electrons in a metal, the superfluid transition temperature in atomic gases would be higher than room temperature. Now it is important that giving the circumstance with which I hold these views "to be the decomposable limits" on the collision process itself, the, "value of the decay" in initiating such a phase, it was important to me to explain how I thought new physics is to be established around our current value thinking in relation to the universe. This picture shows a classical vortex (Hurricane Isabel in summer 2003, NASA image ISS007E14887). So while we had done our research on the values of what a scientist means in regards to an image search on Google, I thought what better way but to introduce my efforts, as well to listing the essence of my understanding, by showing posts, that coincided with the prospective that I was and am establishing as a value in context of the acceleration of this universe. It is to establish how this universe can contain an "relativistic interpretation" about the "beginning and end" contained in this universe and was of some interest to me, as I charted the course and terms related to the searches for the microscopic blackhole holes and what it can ensue in it's decay. A condensate of Fermion pairs (red) is trapped in the waist of a focussed Laser beam (pink). Two additional Laser beams (green) rotate around the edges to stir the condensate. Current-carrying coils (blue) generate the magnetic field used for axial confinement and to tune the interaction strength by means of a Feshbach resonance. After releasing the atomic cloud from the electromagnetic trap, the cloud expands ballistically and inverts its aspect ratio. 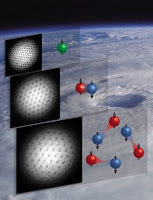 Resonant absorption imaging yields a density profile of the atomic cloud containing vortices. It was important that such an analogy serve to express that "what has always been" can move from one universe to another, by the interpretation of the false vacuum to the true and, by introducing this element in consideration of the lengths such a collision process can be taken too. This has always been of some issue to me about what can take our universe to a "zero point entropy consideration" while understanding that the larger context showing representational for this universe, holds an interesting view, that while large can be taken onto the environs that collisions processes may hold for further introspective views. Now I have been watching the interpretations of Inductive and Deductive valuations over at Bee's held in conversation of theBackreaction: The Block Universe and I am not totally satisfied that either party has really explained what "infinite regress means" while looking to the "decomposable element" with which I hold mathematics as a necessary understanding, while we look to explain the very principals and nature of this universe, and it's accelerations currently established. 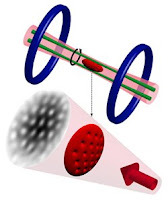 Photo credit: Andre Schirotzek (MIT) Vortices in Gases: Shown is a Vortex pattern in bosonic Sodium atoms (green cartoon) in a magnetic trap, Vortices in tightly bound Lithium molecules (red-blue cartoon) and a vortex lattice in loosely bound Fermion pairs created on the "BCS-side" of a Feshbach resonance. Just having established a link with backreactions block universe posting with this article, I see Phil has explained nicely what the process is to me, and how "infinite regress and decomposable element" are held in the same breathe. I have to give by example my understanding so that one sees this is not a "vacant thought process" with which I work. While one might think I belittle the process it is wholly by my environmental scanning and integrating view that I was able to deduce in regards to the "Plane of Simultaneity" an of "much greater depth" then what is assumed there at Backreaction. This statement of "much greater depth," must be seen in relation to what Tom Levenson in his first introductory article on Cosmic Variance, is revealing by, "Inverse Square law" introduction. Tom Levenson:....what would make current physical ideas as powerful and as intelligibly strange as Newton was able to make his story of a comet travelling from and to distances with out limit? Shadows, are the contention with which "cave views are enlisted" and remain, "in the the box thinkers." You had to know by my reply, that this depth was beyond the 3+1 view held , and pushing further, is the scope and intention of being lead by science, whether one thinks so or not by my representations. That, "in the box thinking" has never left the backreaction interpretations. Phenomenological order, must be introduced, in order to establish current scientific experiments with the actual hypothetical processes, where, such a hypothesis will take you too, leading from, "infinite regress and decomposable limits of definition." at the peak of this Aristotlean Arche. What is Self-Evident. Savas Dimopoulos:At close encounter the particles can exchange gravitons via the two extra dimensions, which changes the force law at very short distances. Instead of the “Newtonian inverse square law” you’ll have an inverse fourth power law. This signature is being looked for in the ongoing experiments. This is a inductive/deductive stance that a person assumes in moving through science, as I understood it. It is important that this process be established and identified as I reveal the thinking about the current state of the universe and how LHC experimental development, are giving new light, to Galactic communications. Microscopic Blackhole decay. Such a question sets the pace for understanding the limits with which we have contained ourselves in regard to General Relativity, and yet, to think that such a result of General Relativity could have ever been embedded as a "beginning and end" in the explanation of the universe, is introduced by time reversals and such?